The X-Series earmuffs are 3M's latest advancement in hearing conservation. New technologies in comfort, design and protection all come together in this groundbreaking earmuff line. The X5P3E earmuffs offer the highest NRR (31 dB) for an earmuff on the market- which makes them ideal for very high noise situations. 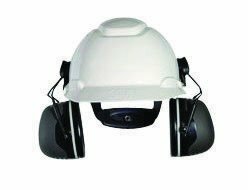 The high attenuation delivered by Z5P3E earmuffs is possible as a result of a combination of advanced technologies including: newly designed spacers, specially formulated foam liners and innovative foam contained in the cushions.